We spend at least one-third of our lives in our bedrooms and bathrooms, yet the design of these essential domestic spaces is nearly always an afterthought. But smart, sleek design can transform an otherwise bland room into a relaxing space that packs in as many features as possible without visual clutter. Instant lofts, bedroom tree houses and bathrooms that unfold like origami to reveal their components are just a few of the 12 beautiful bathroom and bedroom design and décor ideas that follow. Those living in small spaces have to be creative about dividing up the space, but putting up screens only gets you so far. 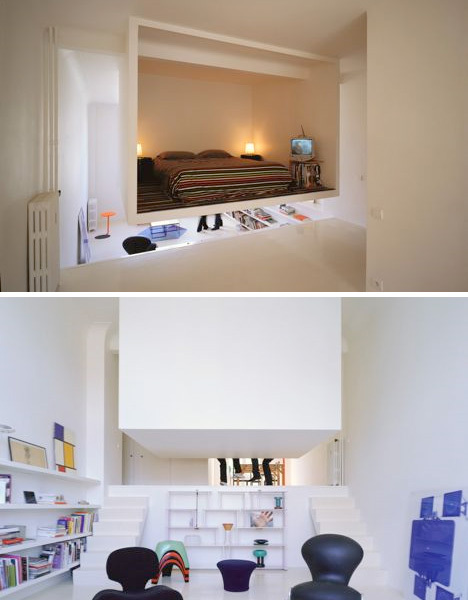 This ingenious solution is an entire loft bedroom that securely hangs from the ceiling, providing a sleeping space that makes use of high ceilings. Positioned as it is within this particular room, the loft still leaves enough room for adults to stand up beneath it, but is low enough to easily walk into from the elevated portion of the space. The back surface of the loft could even be used as a movie screen. At first glance, this bathroom appears to be incredibly simple – a ceiling-mounted showerhead and a slatted wooden floor in a large, empty room. But there’s much more to this elegant, minimalist space than meets the eye. The floor opens up to reveal what lies literally just beneath the surface – a set of benches on either side of a luxurious tub. 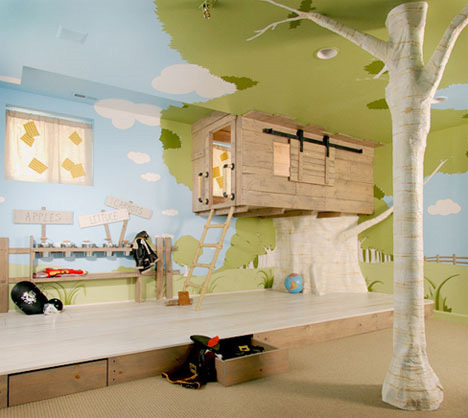 What kid doesn’t love a treehouse, especially one you can sleep in? This loft bedroom design for kids not only expands the usable space in the room, making use of an upper corner that would normally be empty, but it’s incredibly fun, too. 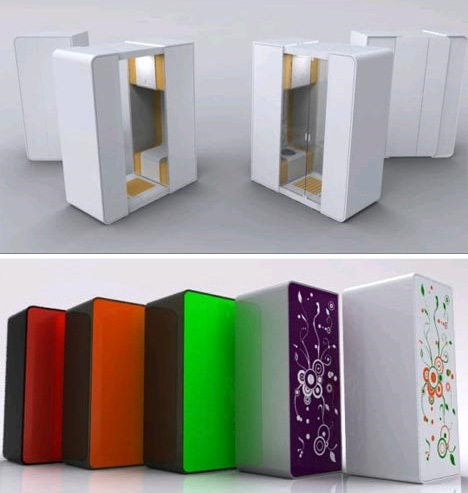 While porta-johns aren’t exactly coveted additions to modern homes, this modular portable bathroom by Fernando Silva has many of the bells and whistles small-space dwellers want. It fits a commode, shower, scale, fan and sink with mirror into one simple portable package in customizable designs. Homes with open floor plans are bright and versatile, but what about privacy when it comes time to turn out the lights? This lofted mini-bedroom idea sections off a little bit of space, putting a bed on an elevated platform and leaving plenty of storage space underneath it. Imagine the space that could be saved in a bathroom if every fixture – from the shower to the toilet – was hidden behind a wall. 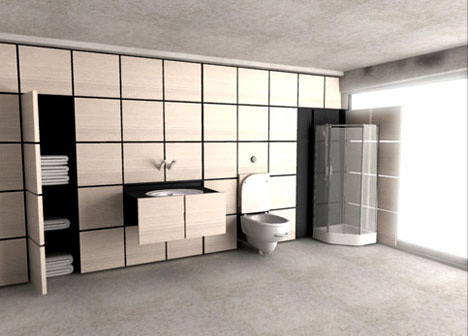 This modular bathroom design features pull-out fixtures that can easily be tucked away when they’re not needed. How much function can you possibly pack (comfortably) into a tiny room? 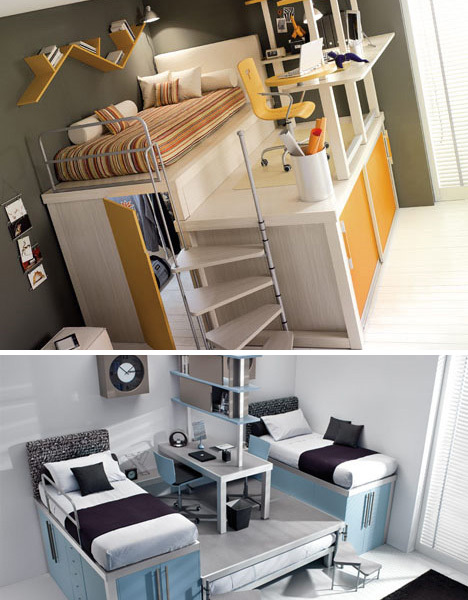 These incredible furniture sets, including this instant loft with a bed, desk, storage space and closet, fit an astonishing amount of utility into the smallest of spaces. In terms of aesthetics and materials, these designs are best for children and teens, but the concept could easily be applied to adult rooms as well. Who says bathrooms have to be filled with cold, shiny white surfaces? 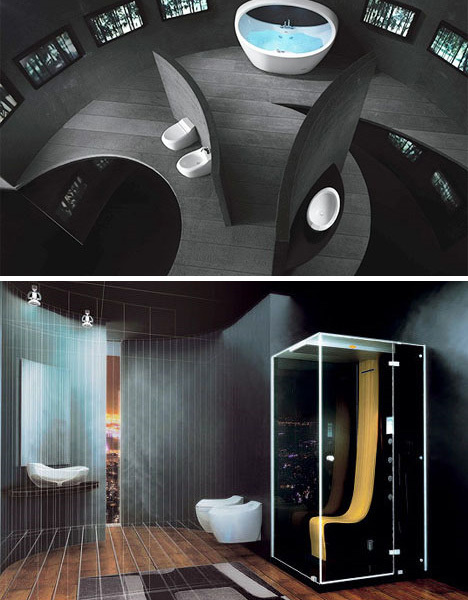 This bathroom design goes against the grain with exotic dark hardwoods and the curving, ergonomic shapes of Morphosis high-end bathroom fixtures. The design of the steam shower in particular is anything but the expected, with a sloping wooden seat that’s both comfortable and beautiful. It’s pretty amazing how many items of furniture designers can pack into a relatively small package, as in this colorful all-in-one room-in-a-box. A trunk unfolds to reveal a desk, bed, wardrobe, shelves and storage boxes – perfect for travelers or just for living a bit more lightly. 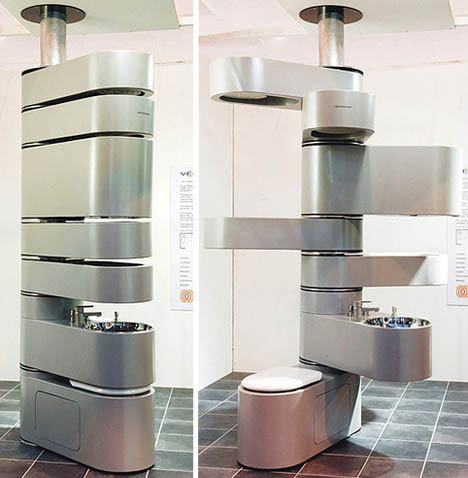 Another space-saving solution for bathrooms is this rather futuristic-looking column of compact fixtures, including lights, a sink, storage space and a toilet. Since the components rotate out, they’re easy to access but tuck out of the way when not needed. 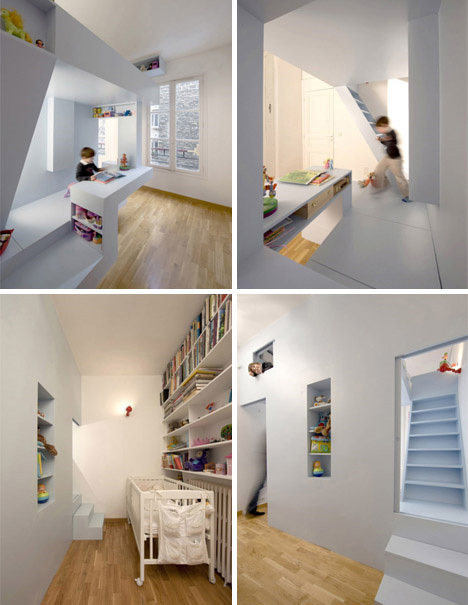 H20 Architects came up with a brilliant way to divide up a small children’s room shared by a baby and a young boy: a central wall that provides privacy on both sides, but also serves as an interactive play space and storage. It incorporates twists and turns, stairs, cubby holes and a loft – much more fun than a simple wall would have been. For a minimalist, there’s nothing more unsightly than a jumble of components like pipes muddling up an otherwise great design. This series of ultra-modern bathroom fixtures eliminates visual clutter, with sleek white and glass bathtubs, lights and other bathroom elements that fit together seamlessly for the ultimate in simplicity.